Crusted port is usually a blend of port wine from several vintages, although single vintage crusted ports have sometimes been made in the past. Unlike vintage port, which has to be sourced from grapes from a single vintage, crusted port affords the port blender the opportunity to make best use of the varying characteristics of different vintages. Crusted port is bottled unfiltered, and sealed with a driven cork. Like vintage port it needs to be decanted before drinking. Although crusted ports will improve with age, the blender often seeks to make these wines approachable at a younger age than for vintage ports. The date on a crusted port bottle refers to the bottling date, not the year the grapes were grown. While crusted port is required to be aged in bottle for at least three years before it is released to the market, most producers keep the bottles for considerably longer, so they are ready to be drunk when sold, and may be enjoyed by consumers who have no space to cellar bottles. 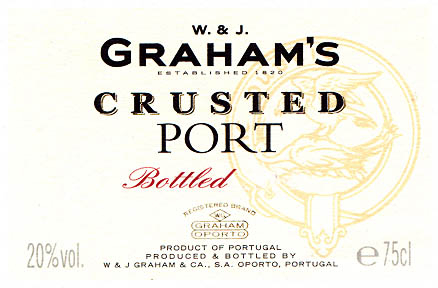 This makes crusted port a popular and affordable alternative to vintage port.